Buducnost is leading 1-0 in the finals of the ABA League after beating Crvena Zvezda on the road. Buducnost got the break in the first game of the ABA League final series as they prevailed over Crvena Zvezda 80-76 in Belgrade. 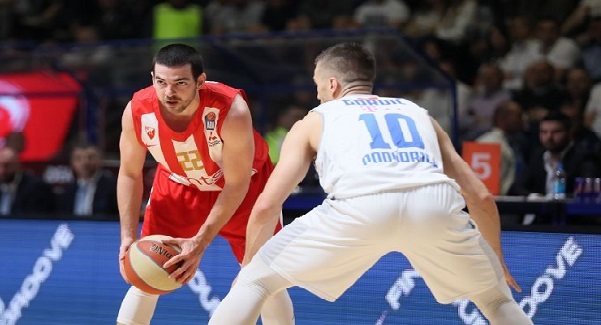 The home team couldn’t keep up with Buducnost’s guards as Nikola Ivanovic and Nemanja Gordic were torching Zvezda’s defense. Ivanovic finished the game with 20 points followed by Gordic’s 17 points. Buducnost had a double-digit lead midway through the last quarter (81-71). Taylor Rochestie refused to give up and tried to save Zvezda’s home court advantage, but not even his double-double game wasn’t enough. Rochestie finished the game with 13 points and 10 assists. Buducnost was off to a good start tonight as they were leading 7-0 after only 90 seconds of the game. However, it was Zvezda that had a minimal lead after the first half (38-37) mostly because of their good defense in the second quarter. Buducnost scored only 12 points in that period. Still, when it mattered the most Buducnost had more energy and focus as they ultimately won the game. Buducnost completed the sweep in the regular season against Zvezda with two wins and now they have a 3-0 record against the reigning champion. The second game is scheduled for Tuesday night.